That simple word can conjure up a variety of different feelings. Ranging from nerves, dread, anxiety to excitement, anticipation, motivation. If you run your own business, or have a employed role which requires you to do a lot of client-facing work, then presenting is an extremely essential skill to develop and master. In the business world, you are constantly presenting, whether you realise it or not. It is how you present yourself to your colleagues, managers, staff, customers, shareholders, stakeholders, clients, suppliers etc. Whether you are sitting at your desk speaking to a colleague. Whether you are on the phone to a supplier. Whether you are in a meeting with team members. Whether you are presenting to a group of stakeholders. Whether you are conducting a 1-2-1 with a client. Whether you are mingling at a networking event. Presenting is not just about delivering a formal presentation to a large audience. It’s how you carry yourself. How you walk into a room. How you look at someone. How you use your voice. The expression you have on your face. Just before you speak, pause. Take in your audience, look around the room at people, make eye contact and SMILE! Speak more slowly. Refrain from the need to speak quickly to ‘get it over and done with’. Use pauses rather than ‘ummm’. Pauses are actually very powerful. Avoid pacing around. Stay rooted to the spot when you are speaking. Then move slowly across to another spot and speak from there for a little while. Otherwise the audience will become distracted by your pacing around. If you are using powerpoint, avoid putting too much information on the slides. Otherwise the audience will focus what’s written on the slide and you want to avoid ‘death by powerpoint’ – reading too much from the slides. Just make just a few ‘short and sweet’ bullet points that you can use as a prompt to talk about the topics. That way you are engaging the audience. Give the audience an overview of what you will be covering in your presentation at the beginning. That way they have an idea what to expect. Before you present, ask yourself the outcome you seek. What do you want to achieve as a result of delivering this presentation? Focus on what you want to happen. 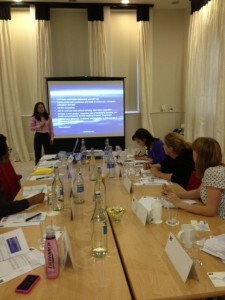 Presenting is a great way to publicise your business, turn prospects into clients, teach others, increase your sales. Overcoming nerves, structuring presentations effectively, being an engaging presenter, taking advantage of presenting opportunities and actively seeking them will make a tremendous difference to your business success. If you’d like to have a chat, please get in touch via our Contact Us page. next post: A day in the life of a working woman….